San Diego, CA – October 24, 2017 – Unisyn Voting Solutions, Inc. (Unisyn) has received its “fifth” complete OpenElect® voting system enhancements Election Assistance Commission (EAC) certification since 2012. As the leader in technology among the voting system providers, Unisyn again places its stamp on the leader board. “The OpenElect® suite of products is unmatched for its security and auditability while providing our customers with unprecedented flexibility, reliability and affordability”, stated Jeff Johnson, President of Unisyn. About Unisyn Voting Solutions, Inc.
Unisyn Voting Solutions, Inc. is dedicated to helping government institutions and private entities optimize their election programs and provide best-in-class service. Our innovative approach enables us to deliver election systems and products that are secure, auditable, flexible, and provide transparency. Unisyn’s OpenElect® suite of products have been certified to the 2005 Voluntary Voting System Guidelines (VVSG) Certification from the Help America Vote Act (HAVA) guidelines as set forth by the U. S. Election Assistance Commission for a digital optical scan voting system, and they are built on a Java and hardened Linux platform. Unisyn makes code available for review by trusted election officials as part of a procurement process. As a wholly-owned subsidiary of International Lottery & Totalizator Systems, Inc., Unisyn also designed the InkaVote Plus precinct ballot counter (PBC) which is currently used in Los Angeles County, California. We are committed to providing unparalleled service, enhanced security and increased voter confidence, helping your next election to run efficiently and smoothly. Call (760) 734-3233 today or fill out this form and we will contact you. Please provide just a brief overview. We will gather more detailed information when we contact you. OpenElect has been certified by the United States Election Assistance Commission (EAC) to the Voluntary Voting System Guidelines (VVSG). 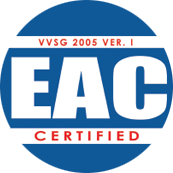 Our certification documents can be found at the EAC website. *OpenElect® is a registered trademark of Unisyn Voting Solutions. © 2019 Unisyn Voting Solutions. All Rights Reserved.